Researchers identify the single epigenetic mutation which causes autism. Last December, researchers identified more than 1,000 gene mutations in individuals with autism, however, it was still unclear as to how these mutations increased the risk for autism. Now, UNC School of Medicine researchers are the first to show how one of these mutations disables a molecular switch in one of these genes and causes autism. The opensource study is published in the journal Cell. Previous studies shows that an enzyme called UBE3A can be switched off when a phosphate molecule is tacked onto UBE3A. In neurons and during normal brain development, this switch can be turned off and on, leading to tight regulation of UBE3A. However, the current study found that an autism-linked mutation destroys this regulatory switch. The data findings show that destruction of the switch creates an enzyme that cannot be turned off. As a result, UBE3A becomes hyperactive and drives abnormal brain development and autism. The current study used human cell lines, as well as mouse models. The team explain that because this autism-linked UBE3A mutation was part of the Simons Simplex Collection, and they previously had been funded through a Simons Foundation grant, they had access to the cells that were used to find this one mutation. When the lab sequenced the genes from the cell samples, including cells from the child’s parents, the results showed that the parents had no hyperactive UBE3A, however, the child did. The researchers state that this is because the child’s regulatory switch was broken, causing UBE3A to be perpetually switched on. When the child’s mutation was introduced into an animal model, dendritic spines began to form on the neurons. The lab stress that having too many dendritic spines has been linked to autism in numerous studies. Their findings thus pointed to hyperactivation of UBE3A as the likely cause of this child’s autism. The researchers also note that it was previously thought that too much UBE3A might cause autism because duplication of the 15q chromosome region, which encompasses UBE3A, is one of the most commonly seen genetic alterations in people with autism. This is called Dup15q Syndrome. The current study also found that protein kinase A (PKA) is the enzyme that tacks the phosphate group onto UBE3A. This finding has therapeutic implications, particularly since drugs exist to control PKA. The lab hypothesize that it may be possible to tamp down UBE3A in Dup15q patients to restore normal levels of enzyme activity in the brain. Future work with an animal model of Dup15q will be used to test this therapeutic approach. Deletion of UBE3A causes the neurodevelopmental disorder Angelman syndrome (AS), while duplication or triplication of UBE3A is linked to autism. These genetic findings suggest that the ubiquitin ligase activity of UBE3A must be tightly maintained to promote normal brain development. Here, we found that protein kinase A (PKA) phosphorylates UBE3A in a region outside of the catalytic domain at residue T485 and inhibits UBE3A activity toward itself and other substrates. A de novo autism-linked missense mutation disrupts this phosphorylation site, causing enhanced UBE3A activity in vitro, enhanced substrate turnover in patient-derived cells, and excessive dendritic spine development in the brain. Our study identifies PKA as an upstream regulator of UBE3A activity and shows that an autism-linked mutation disrupts this phosphorylation control. Moreover, our findings implicate excessive UBE3A activity and the resulting synaptic dysfunction to autism pathogenesis. 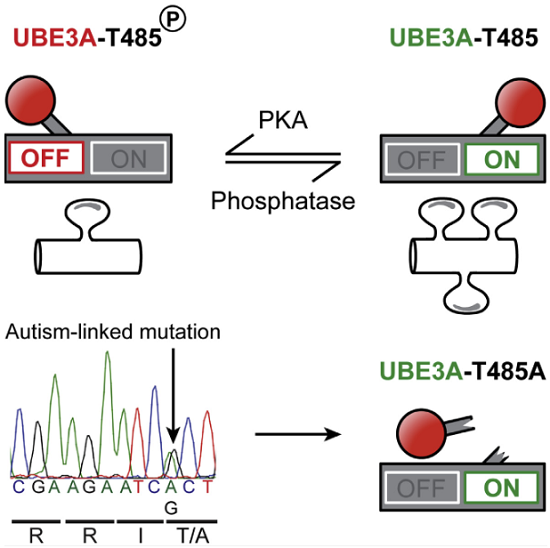 An Autism-Linked Mutation Disables Phosphorylation Control of UBE3A. Zylka et al 2015.